Inspired by the Enchanted Tiki Room, this is a twist on the classic Pina Colada. A more upscale version topped with nutmeg and cinnamon to balance out the sweetness of the cream of coconut and pineapple. 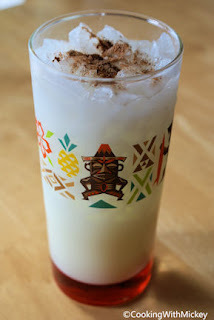 In a cocktail shaker, pour pineapple juice, coconut cream and rum. Shake. Pour mixture over crushed. Top with cinnamon and nutmeg. Garnish with drink umbrella. Serve. Note: Don't have pineapple juice and/or cream of coconut? Substitute pineapple juice and cream of coconut with pina colada mix.